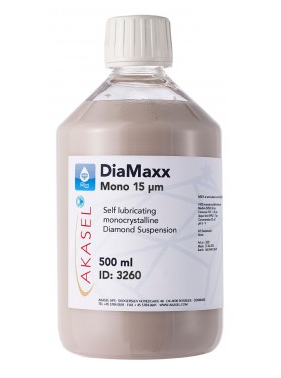 DiaMaxx is a ready mix of lubricant and suspension, it is permanently stable and thus ensures reproducible results. Based on our High Concentration Aka+ Suspensions and our high removal Aka-Lube, Clear+ we have formulated a combination product that combines quick preparation with ease of use. 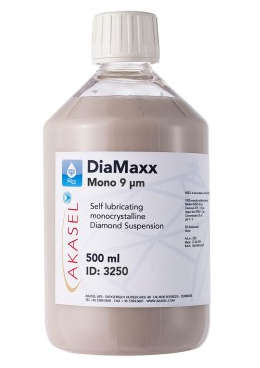 DiaMaxx does not contain any oil and is therefore very easy to clean. 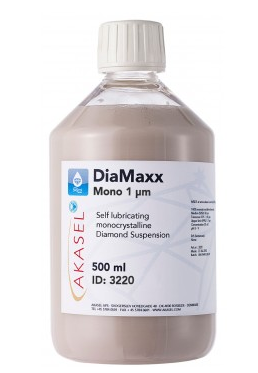 DiaMaxx meets the highest requirements in metallographic sample preparation and is available with polycrystalline diamonds as DiaMaxx Poly and with monocrystalline diamonds as DiaMaxx Mono. Monocrystalline diamonds consist of one, blocky crystal with fewer cutting edges. 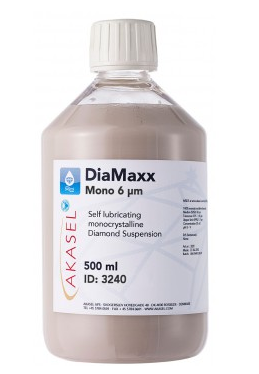 They are not as efficient as polycrystalline diamonds, but very well suited for the preparation of softer materials.